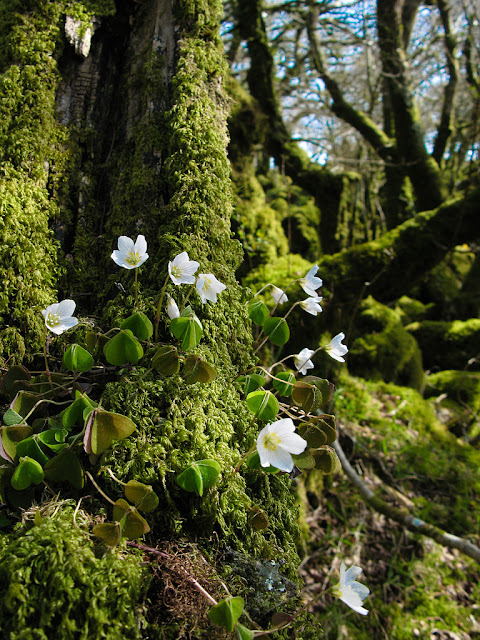 Wood sorrel is found in early spring (flowering between April and June) in woods and other shady places and is often found at the base of a mossy tree trunk (as in this case). It has a characteristic shamrock-shaped leaves and a sharp lemon like taste. Wood sorrel has been eaten in salads certainly as early as the 14th century. It is still used in salads today and can be pulped to sharpen up sauces and soups. However, due to the its high content of oxalic acid it should only be eaten in moderation. Apparently, American Indians fed the root of these plants to their horses to increase their speed and in early Europe the bruised leaves were used to treat cuts and bruises.